Buy stuff, get free stuff. It's as simple as that. We now have a Free Rewards program here at C. B. Gitty. You already buy your parts and gear here, and now you can get extra FREE stuff every time you do. Whether you're buying a few sets of tuners or a season's worth of parts, our rewards program will make sure you go away feeling special. We have the following reward tiers. Please note that the reward items available in each vary based on availability over time. Any images shown are examples only. $50.00 Reward Level - Free Shipping for US Customers! Simply pick out the regular items you want, then see what your cart subtotal comes to (before shipping costs). Then browse over to the Free Rewards category and click on the reward level you qualify for - this will let you pick the specific reward. See something you want in a higher tier? Add a few more goodies to your cart until you reach that level - you know you'll use them eventually anyway! 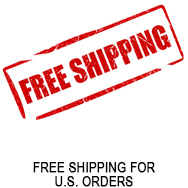 You can add ONE free reward item (from any tier) to your cart per order, and have it be free. For each reward tier there is a single multi-option product listing that lets you choose the specific reward item you want. Once added to your cart, a discount of the full price of the reward item will apply. The reward items for the different tiers will vary over time based on what we have available; we do not guarantee that any particular reward will be available at any time. We reserve the right to change the terms, reward levels, specific rewards and other details of this program at any time. Rewards must be added to each order before checkout and cannot be claimed for past orders. If you add more than one reward item to your order, only the first one will be free.